Our congregation has many opportunities in worship, programs, ministries, and studies to create, deepen, better understand, and live out our relationship with Jesus Christ. Read the weekly newsletter to keep caught up on all the happenings going on in our church family and local community. Whether you are new to our wonderful community of Bainbridge or just new to our church, we are delighted that we can share our faith together. The Southwest District Conference will be held Sunday, April 28, beginning at 3:00 p.m. at First United Methodist Church in Albany. If you plan to attend, please contact Pastor Mike, as the district has requested he report how many are coming. The South Georgia Conference has experienced multiple catastrophic events in the past three years, and churches have been actively engaged in their own communities and beyond to meet the needs of those impacted by these storms. United Methodists have been a beacon of light during dark skies by being the hands and feet of Jesus Christ - before, during, and after the storms. Join the Conference Discipleship Teams for "Witnessing Through The Storm: The Church Before, During, and After Natural Disaster," a day of exploring the many ways individuals and churches can be prepared in the event of a natural disaster and "be the church" in their communities and throughout the world. This will be a day of equipping, inspiring, building capacity, and preparing for our future impact in disaster response ministry. Special guests include Cathy Earl, UMCOR, US Disaster Response & Partner Relations; Jenny Phillips, Global Ministries, Creation Care Program Manager/Sustainable Development; and Jim Cantore from The Weather Channel. This event takes place Saturday, April 27, from 10:00 a.m. to 4:00 p.m. at Cordele First United Methodist Church. The registration fee is $25 (which includes lunch), and you may register at sgaumc-reg.brtapp.com/WitnessingThroughTheStorm. The new Cub Scout Pack #519 is going gang busters! Come and join! They meet on Tuesdays from 6:30 – 7:30 p.m. The Pack is open to Kindergarten through 5th grade boys and girls. For more information, please contact the Church Office. Click HERE to go to the Scout page. Our Wednesday Night, Christian Fellowship Dinners have resumed. Please remember that if you have standing reservations for our Christian Fellowship Dinner, cannot attend, and do not cancel, we ask that you please pay for your meal. The Staff - Parish Relations Committee is pleased to announce that Bishop Lawson Bryan has appointed Rev. Melissa Traver as Pastor of Bainbridge FUMC, effective June 2019. Rev. Traver was ordained an Elder in The United Methodist Church in 2008. 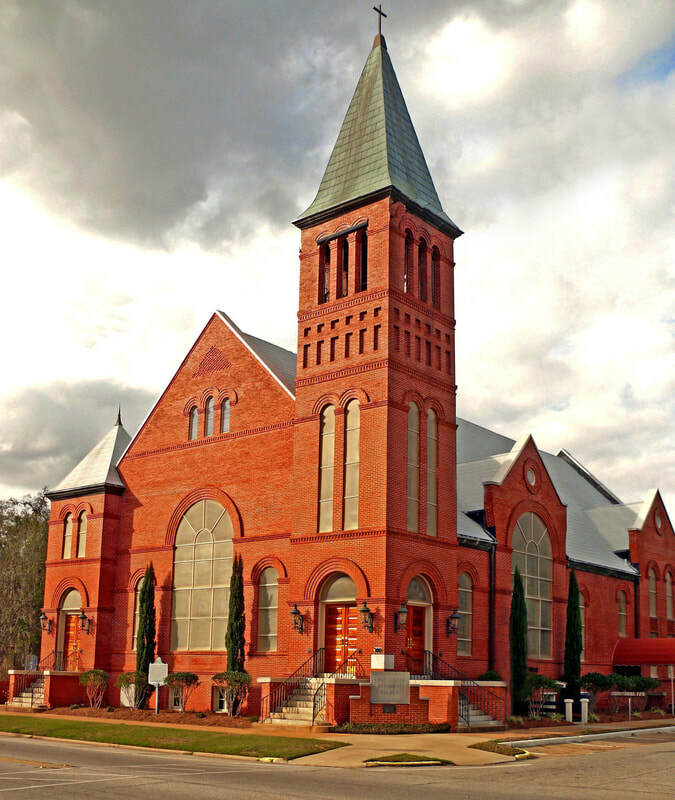 She is currently serving as the Pastor of St. Peter UMC in Columbus, Ga.
Rev. Traver is married to Chris, and they have two young sons: Xander, age 14, and Grayson, age 9. Rev. Traver is excited to begin her ministry among us and looks forward to becoming a part of our great church. Rev. Traver’s first Sunday will be in June, and further information will be shared in the days to come concerning welcome events for Rev. Traver and her family. I know you will join us in praying for Rev. Traver as we prepare to welcome her to Bainbridge FUMC and to our community. ​The Staff-Parish Relations Committee wishes to thank Rev. Mike Brown for his years of ministry among us at Bainbridge FUMC. We wish both him and Tammy well in their new ministry at Waycross FUMC and will keep them in our prayers during this time of transition. We will honor them both with a church-wide reception in May, and details about that gathering will be shared with you soon. For more information, click here to go to the Youth Ministries page.